Remain calm. If you feel that you are so nervous about driving in the conditions you are faced with, that you are shaking or reacting with a rigid or jerking motion you should find a safe place to pull over and park it. Winter driving requires you to make fluid, calm calculated movements in order to maintain traction or regain control in skids, slides and spin outs. It also requires quick but logical and clear thinking. Don't be so stiff with steering wheel, make love to it. Now please consider....some uneasiness is normal with less experience but with confidence in your skills and a patience you can drive in some pretty bad weather successfully and achieve a good balance of calmness yet respect for the danger. However, the worse the weather, the more difficult it is to be in full control due to an increase in unpredictability of what can happen since there are many variables that naturally occur. This is why it is necessary to take extra precautions like slowing down. Even if you think it is not necessary. Our natural instinctive reaction is not the proper reaction to driving on snow, ice, or even rain. Instinctively we want to correct a situation as soon as possible and get back on a desired course. That is not how you want to handle your vehicle when you are driving on slippery roads. You must remember that any sudden braking or jerking of the steering wheel will increase your chances of breaking traction. No matter what happens you must react smoothly. Even when you must react quickly, do it in a smooth calculated manner. 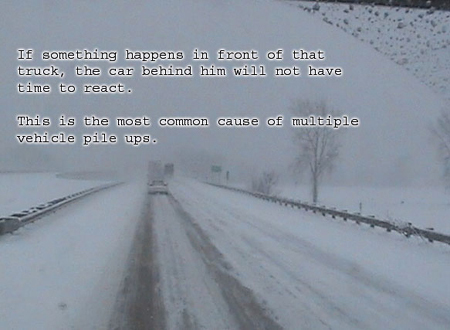 Being proactive is a powerful tool and is at the foundation of many important winter driving safety tips. We should have a cushion of space at all time but inclement weather makes it even more beneficial to have that open space. It’s easy to control the space of the vehicles in front of you but take a look behind you to see if people are tailing you too. You may have to slow down more so that they will pass. Try to avoid having people ride casually beside you. Some pile up crashes could have been avoided had the drivers practiced this safety tip. 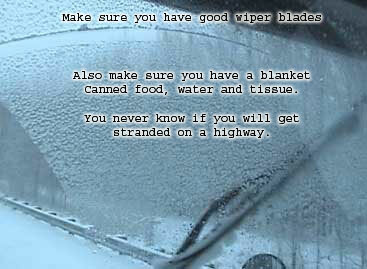 A safety tip that is always important but especially during winter driving in slick weather is to look well ahead. Keep an eye out for other vehicle's brake lights. 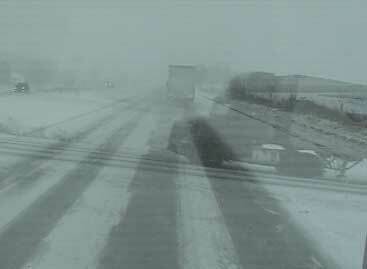 Pay attention to see if they began skidding so that you may identify an especially slick spot before you get to it. Also if there is a spin out or accident up ahead you can slow down before running up on it so you don't have to react quickly. You also want to be sure to scan lanes on the opposite side of the highway in case there is something you can do to avoid someone coming across to your side. As mention earlier be sure not make abrupt movements. Accelerate and decelerate slowly. Do not change lanes quickly or correct over steering quickly. Snow and ice will greatly impair your ability to keep traction. Quick changes on these slick surfaces is what causes a majority of accidents due to skids and jack knifes. When you are driving on back streets in the snow and ice, slow down when approaching intersections especially if you can’t see up the street. Be aware that some clown may be coming up on the intersection from the other direction about to slide right through the stop sign. Remember many people don’t know how to drive on snow and ice. -If you find yourself in a skid, steer in the same direction that the rear is sliding towards. Don’t brake, simply get off the gas if you need to slow to match your speed of travel with the speed of you tires to regain traction. -When you began getting traction, turn back in the opposite direction to straighten out your vehicle. -Straighten out your steering wheel and regain control of your truck. -Remember not to brake or accelerate quickly or you will loose traction again. Do you have Winter Safety Driving Tips To Add? I know there are plenty of tips that I forgot to mention about winter driving, if you have more to add please feel free to do so below. Also if you have questions about winter driving, feel free to ask. See the comments box at the bottom of the page and always make sure you have reliable insurance. IF you have a winter driving story or experience don't post it below. Below post your winter driving tips. post your winter driving adventures here. Slow you go, fast you crash!! Remember although time is money, it better to arrive alive and safe than having an accident. When in doubt slow down! SLOW YOU GO, FAST YOU CRASH! brake often and brake early.